I hit the jackpot! Last week I went to the grocery store to pick up some fruits and veggies and there was a produce special. I bought a bag of twenty bananas for 99 cents! Yay, me! I was thinking of all the banana recipes I could try out. Of course there’s a banana split and banana pudding, but I wanted to make something I’ve never made before. I decided to try an easy bananas foster french toast recipe. I truly have a sweet tooth, so this is a great excuse for me to have something a little sweet for breakfast. Most bananas fosters recipes require rum to be used, but since my babies were going to eat some I opted to use rum extract just to be on the safe side. 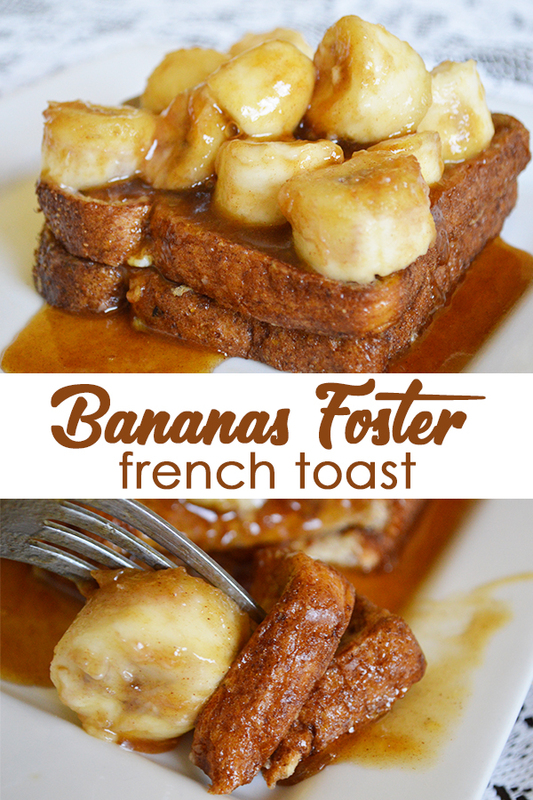 The flavors of oranges, vanilla, and rum give this bananas foster french toast a little something extra. My husband loved it and I think I’ll serve it at my next brunch! For French toast, in a small bowl mix all ingredients, except bread. Pour mixture into a casserole dish. Soak bread on each side for 30 seconds. Over medium heat in a frying pan, cook bread on both sides until golden brown. For banana jubilee, in a sauce pan over medium heat, warm butter until completely melted. Add butter, sugar, cinnamon, and extracts to pan. Cook for 2 minutes, constantly stirring. Add bananas to pan and cook for 1 minute. 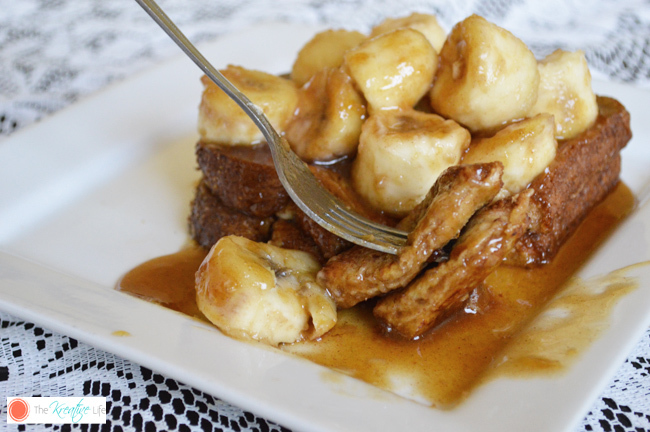 Top French toast with banana mixture. Serve warm. $.99 for 20?!? that’s a steal! this looks awesome, definitely adds a lil somethin’ to good old french toast, can’t wait to try it out! Thanks, Amanda! I was so shocked when I saw the price. I had to take a second look. Yummy! Good deal on the bananas and great idea to use them this way. Can almost smell that wonderful flavor! See you soon! 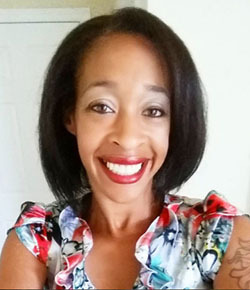 Hi, Denise! I was so surprised to see how cheap they were. Thank you for stopping by. Oh I bet the flavors are perfectly matching! YUM! Hi, Jutta! Thanks for the invite. I’m heading that way now. This looks delightful. I might have to make this myself this weekend! Thank you for the invite, Randi! I’m heading that way now. This looks so delicious! 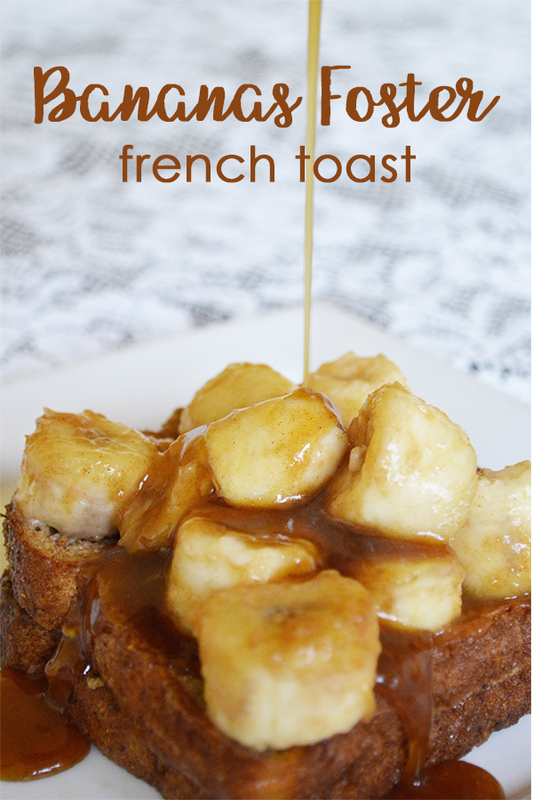 I love french toast and will definitely try it! Oh my goodness! Anything with bananas is yummy, but this looks FABULOUS!